IntelliiD Cydia Tweak Displays Caller ID For Unknown Phone Numbers On iPhone! The IntelliiD Cydia tweak displays an incoming caller ID, for all phone numbers, yes even if you haven’t got them saved on your iPhone as contacts! This Cydia tweak basically works by searching the incoming number into a US/Canada calling database. 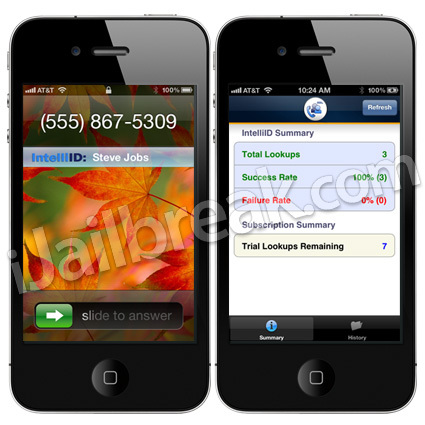 This means if you do not have CallerID on your iPhone, IntelliiD could be a workable replacement. Additionally, the IntelliiD Cydia tweak can be useful even if you do have CallerID, but find yourself getting numerous phone calls from unknown numbers. Note: The IntelliiD Cydia tweak only searches a US/Canada calling database, thus it does not work reliably in countries besides the US and Canada. If you are interested in the IntelliD Cydia tweak you can find it through Cydia for a starting plan of only $4.99! This will get you up to 250 queries until you will need to re-load your IntelliiD subscription. A $7.99 plan is also available that will grant you up to 500 queries. Let us know what you think of the IntelliiD Cydia tweak in the comments section below. is any group ever gonna crack this? Is there a tweak that can unblock unknown or blocked incoming calls? Anya, that’s what this is ! If it would normally come across as blocked, IntelliId searches for it and then show you the number/ name of who’s calling ! Not quite.. if it’s blocked then there’s no number to use in a query. But it is a great tool for someone like me, who gets lots of customer calls. I get to see city & state even if the number is unlisted. Really helps with pre-screening for priority.